At the beginning of each year, the present value of all expected future benefits from all enrollees divided by the total expected future days of claims from all enrollees. At the beginning of each year, the present value of all expected future benefits of new beneficiaries during the past year divided by the corresponding total number of claim days. At the beginning of each year, the present value of all expected future benefits of all beneficiaries during the year divided by the corresponding total number of claim days. The total expected daily benefits available each year for all beneficiaries divided by the total expected number of claim days. For each new beneficiary, the expected total future payments divided by the expected total number of days in claim. The expected total future payments to each beneficiary for each 12 month period divided by the expected future number of days in claim during such period. Another related issue is whether the minimum $50 is indexed by CPI or not. 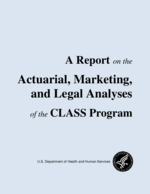 While it is clear that benefits are indexed after claim, it is not clear that benefits are required to be indexed while the enrollee is active past the first 5 years of the program, but not in claim status47. Note that we have proposed the benefit amounts starts indexing on the second year of an individual’s enrollment, which is the most liberal interpretation. We take the position that the $50 minimum average is not indexed and elects the first calculation method described above. We plan to monitor actual results and adjust benefits if necessary in order to comply with the requirement.